His stage debut took place in 1901 at the Court Theater in Detmold. In 1902 he continued his education and in the 1903-04 season he was engaged by the Municipal Theater of Landshut (Bavaria), from 1904 to 1905 he appeared at the Municipal Theater in Regensburg. In 1905 he became a member of the Carl Theater in Wien, whose member he remained until 1910. 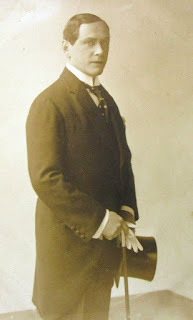 Here he sang in numerous operettas and and also participated in the world premieres of "Die Schützenliesel" by Edmund Eysler (1905) and "Zigeunerliebe" of F. Lehár (1910). In the 1910-1913 seasons he sang at the Raimund Theater in Wien, then a season at the local Johann Strauss Theater. From 1915 until his early death, he worked at the Münchner Theater am Gärtnerplatz. He was very successful in operettas of Franz Lehar, Leo Fall, Oscar Straus, E. Kalman and E. Eysler. He retired from the stage in 1917.